The intersection of 23rd and Union Streets has long been considered the sacred heart of black Seattle; however, over the last five years, it has been increasingly cited as the city’s “most controversial block,” due to the fierce development pressures encircling it. The Africatown Community Land Trust (ACLT) conceived of an idea for an activation on the 2.4-acre parcel, as an opportunity to display its proof of concept to the world: that a historically black community could design and build a future for itself, in the context of intense development pressure. 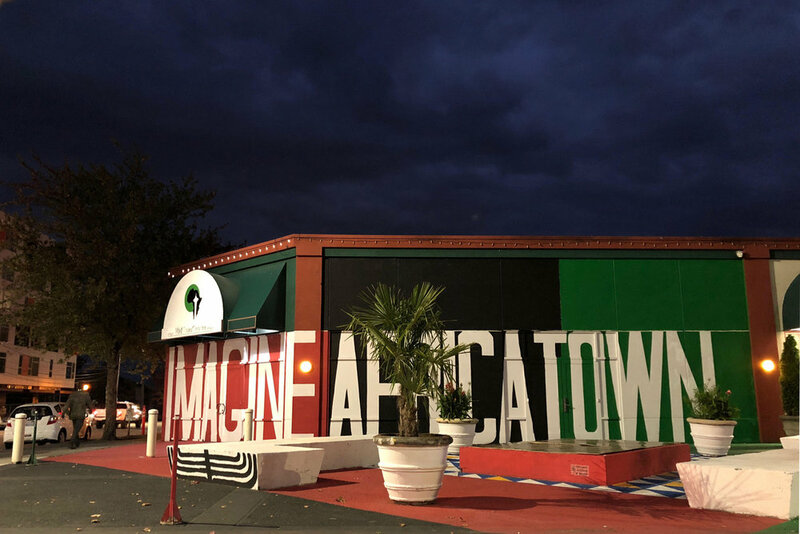 In 2017, Studio Zewde was hired by the ACLT to design the activation, taking part in a process that began with a series of “design ciphers”—Africatown’s own remix of the charette—with the current and previous residents of the neighborhood. The community ciphers produced three key themes: “a place to be,” “a place to prosper,” and “a place to play.” The design evolved into an outdoor living room on the street corner, built of concrete. The 20,000 square feet of parking lots were painted with a singular graphic, celebrating the existence of the people who gather there today. The orientation of the temporary plaza faces forthrightly toward the intersection, speaking to its historic legacy, and making a statement with the spectacle of its construction and everyday use. While most precedents for temporary activations employ wood or salvaged materials, the activation was intentional about its choice of concrete: a material not commonly used for community-built projects or for temporary applications. Studio Zewde worked with Africatown to hire young people from the community to build the formwork and pour the concrete. Hundreds more from the community volunteered, creating a weeks-long spectacle of community-powered labor in the construction of a prototype for the future of Africatown.